How to Soften Crunchy, Hard Carpet. Call 303-530-0646. Find us at cleancareboulder.com. For more articles like this, go to Cleancare Articles. Have you ever cleaned your carpet yourself or hired a professional and thought the job looked fine when it was finished? Then, after it was dry, you walked on it with your bare feet and it felt hard and stiff. "What the...?" you think to yourself. 1) Hard Water: If you have hard water in your home and this is used by you or your professional cleaner, after your carpet dries you will be left with some minerals in your carpet. These minerals attach themselves to your carpet fibers making your carpet feel "hard." Over time, with foot traffic and vacuuming, those minerals will detach and brake away from your carpet. 2) Residue From Carpet Cleaning Agents: If the cleaning agents that were used were not properly rinsed and extracted out of your carpet, you'll feel that soap residue in the fibers when you touch them. If the residue is slight, vacuuming will eventually get rid of this residue. However, further rinsing and extracting will need to take place if heavy soap residue exists. 3) High pH: When we mention pH, we are talking about alkalinity and acidity. A neutral pH is 7. Numbers above 7 are on the alkaline side of the scale. Most carpet cleaning products are above a 7 pH because most soils you need to clean are on the acidic side (below 7 pH). Now here is where the crunchy carpet comes about. The higher the pH, the more aggressive the cleaner. However, once you get at an 11pH, you are using a very harsh cleaning product. If carpet stays at 10 or 11 pH after cleaning, you are guaranteed of having hard, stiff, crunchy carpet. Your goal is to have a neutral pH of 7 after carpet cleaning. 1) Vacuuming and Grooming. If the cause of your stiff carpet is hard water, the more you can contact the fibers, the more the minerals will be dislodged. 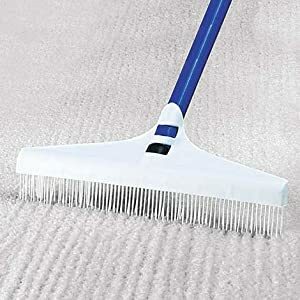 Vacuuming often and using a carpet grooming rake will help bring back softness to your carpet fibers. 2) Rinsing and extracting. If you did not use clear water as your final carpet cleaning step or your "professional" did a really quick job (we call this "splash and dash" service), then you have a residue problem. Vacuuming often will help. However, rinsing the residue out of your carpet is probably necessary. If you have a carpet cleaning machine, fill it with clear water and 1 cup of white vinegar. Go over all carpet with this solution until no more soap is being extracted. If a professional did this to you, call them back and demand a re-service. This is unprofessional and any reputable carpet cleaning company will make this right. If you cannot get satisfaction, give us a call at Cleancare of Boulder at 303-530-0646. We'll give you back that fluffy, soft carpet you want. 3) Neutralizing Treatment: If you used an aggressive or all purpose cleaner on your carpet, chances are your carpet was left in a high pH state. To neutralize or lower the pH, you can use a common household product. 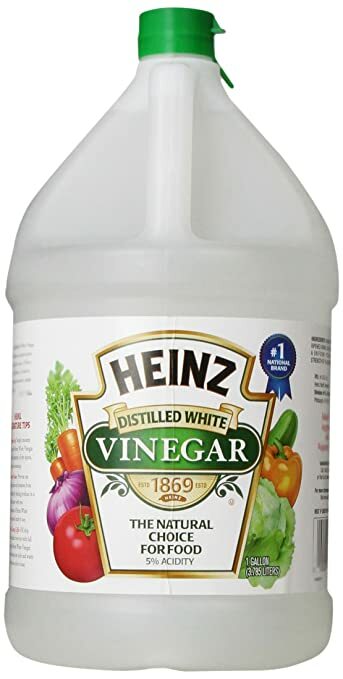 White vinegar is a natural cleaner that is on the acidic side of the pH scale. To bring down high pH (above 7) you need to apply a low pH (below 7). To do this, simply mix 1 cup of white vinegar to 1 gallon of water. Spray or mist (you can buy a pump sprayer at Home Depot relatively cheaply) onto all areas of your carpet. Follow with grooming all areas while still wet with carpet groomer (available at WalMart or at Cleancare of Boulder). A Vinegar treatment can be beneficial to all 3 factors causing hard, stiff and crunchy carpet. It will result in clean, soft, fluffy carpet... the kind you bought! Get 1 Room of Carpet Cleaned For FREE!